Halloween Camp runs from Tuesday 31st October to Friday 3rd November from 10-1pm each day this spooktacular camp will be for all players aged 5-16yrs. 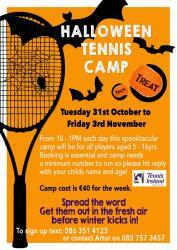 Booking is essential and camp needs a minimum number to run so please text 087-7901663 with your child's name and age! Camp cost is €40 for the week. Spread the word-get them out in the fresh air before winter kicks in!